There are hundreds of bazaars along the famed Silk Road, and each one has its own unique charm. The common image is a labyrinthine network of small alleyways and corridors with quaint little stalls selling everything from gemstones to carpets to pre-Soviet antiques. 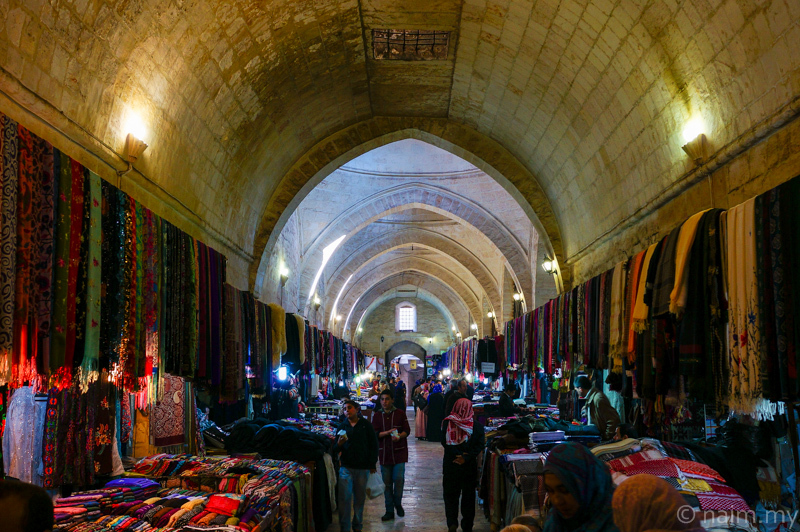 Ever visit Urgut bazaar in Uzbekistan or Urfa market in Turkey? Yeah, that’s the idea. Dordoi Bazaar in Kyrgyzstan, on the other hand, is a modern bazaar for a modern girl. There’s nothing cute, traditional or charming about it—it’s literally just endless rows of metal shipping containers turned into shops. And with anywhere between 30,000 and 100,000 of these multipurpose metal boxes (it depends on who you ask), Dordoi Bazaar makes for a fun shopping adventure and a pleasantly unorthodox bazaar experience. The majority of the market is built of double-stacked shipping containers: the lower one serves as a shop and the upper one is used for storage. Despite the uncertainty of how many vendors actually operate in Dordoi Bazaar, all agree that it’s one of the largest and most famous markets in all of Central Asia. To the untrained eye, Dordoi Bazaar looks like one huge, crazy market: a mishmash of motor oil, fake Zara jeans and fur vests being sold alongside one another, often with a cute lady offering deep-fried bread and tea while you contemplate your purchase. Different sections of the market are organized by product type–automotive supplies, electronic equipment, clothing, shoes, toys, etc. Legally, it’s actually an agglomeration of several independent markets adjacent to one another, but due to the lack of fences, borders, or intelligible signs, it’s hard to tell when the car parts section ends and the leather shoe section begins. Goods are also differentiated by the country of origin. Pricier merchandise comes from Turkey, South Korea, and Europe, but the vast majority is “made in China.” If you’re looking for the best value, it helps to compare prices in different rows and sections of the market: the exact same product in one row might cost half as much in anther row. It goes without saying that you should bargain with the vendors if you want a lower price (this is where speaking Kyrgyz, Russian, and even Turkish comes in handy). In my experience, vendors have rarely blatantly tried taking advantage of me by charging a crazy price, and whenever the price did seem really crazy, I simply found the same item somewhere else and tried my luck again. But it certainly does help to know, ballpark, what things are worth–i.e., a faux Nike velour warmup suit should not cost $197 USD. The bazaar boasts a fascinating history as well. Compared to neighboring Kazakhstan and Russia, Kyrgyzstan has low customs fees on goods from China. Dordoi’s business model is based on importing goods from China and re-exporting them to Western markets for a sizable profit. Traders come from as far away as Russia, Kazakhstan, Uzbekistan, and elsewhere–sometimes traveling for days to make it to Dordoi and back–for the sole purpose of purchasing cheap Chinese imports. At any given moment, you can see men pushing dollies stacked with huge packages for onward transport, monotonically telling people to move out of the way—it’s really quite a sight. I won’t get too much into politics, but the creation of the Russian-led Customs Union was a real game-changer for Dordoi Bazaar. The Customs Union is an economic union joining Russia, Belarus, Kazakhstan, and–since January 2015—Kyrgyzstan and Armenia. According to a recent article from EurasiaNet.org, some sellers in Dordoi Bazaar estimate that re-exports have dropped by 90% since the creation of the Customs Union, which officially became the Eurasian Economic Union in January. Since Dordoi prospers thanks to low customs tariffs with China—and membership in the economic union requires Kyrgyzstan to raise taxes on imports from China—this will negatively affect Dordoi’s competitiveness. The bazaar will go on, but it might not have the same crazy feel in a few years as it does today. I guess that means only one thing: if you want expertly forged Levis for the price of a Big Mac Meal, come and get ‘em while they’re hot!